The town council met on Tuesday 8th January to debate a wide range of issues. The mayor presented an award to Spout Yard Park as part of the 2012 East Midlands in Bloom competition. The park won the Judges Award, and it was accepted by trustees Carole Romaine and Chris Brook. Carole praised "the tireless work of the volunteers and the trustees". The park costs between �5000 and �7000 a year to operate. "Funding is always an issue for us," Carole said. Mr Tunicliffe spoke about the traffic management system at Louth cemetery, criticising its confusing one-way system. He said the signs on the verges need updating, the car park should be returned to its use as a car park, and the London Road exit needs to be used as an exit. One of the issues is the way people drive in any direction, and because the roads are narrow cars go onto the grass to pass each other, churning it up. "It's made no difference to add chippings. Something that will damage the cars will need to be in place," Mr Tunicliffe said. Councillor Margaret Ottaway, who sits on the council's cemetery committee, apologised for the state of affairs. However, talking of the traffic coming on to the grass verges, she said "we cannot police it." She was similarly pessimistic about making significant changes to the situation, telling Mr Tunicliffe "some of the things you're asking for are nearly going to be impossible." The 149 homes at Fulmar Drive proposed by Taylor Wimpey will be up for a planning review on 17th January, even though ELDC has already voted not to allow this. As I understand it, this is a formality. There has to be a second review because the decision was taken against the advice of the planning officers. However, since the vote went so overwhelmingly against the developers I don't think this meeting will change anything. Councillors discussed the report of the flood liaison group and the flood alleviation scheme proposed to be put in place by 2015. They noted the damage to bats and water voles by the 2007 floods. The plan is to put in an overspill reservoir upstream of Hubbard's Hills. Speaking of the scheme's ecological impact, Councillor Andrew Leonard said "Hubbard's Hills itself will not be affected in any way. It's better to have the overspill at Hubbard's Hills." We've had a few flood alerts recently, leading to the very saturated ground that you can see in the picture to the left. 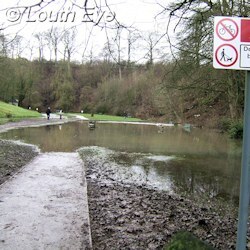 Councillor Leonard explained that this is due to several natural springs gushing over. "Even a pump can't cope with the amount that's gushing out at the moment." The mayor Jill Makinson-Sanders was enthusiastic about the plans. "It's quite an exciting scheme that will add to the biodiversity of the area. It will create a nice green corridor for Louth." The council commented on three consultation documents produced recently. The Draft Core Strategy included a retail study that provoked a lot of discussion. You could almost hear the gnashing of teeth. "The whole thing is flawed from start to finish," Councillor Leonard said. "The consultants specialise in obtaining out of town shopping. It does somewhat smell." Councillor Gus Robertson criticised the means of getting data, which apparently came from 600 phone calls around the district. "I think the whole thing is a nonsense," he said. Councillor Trevor Marris noted that Holton Le Clay was included in Louth's shopping catchment area in the report, when it isn't. In fact the telephone survey carried out in March only included 500 households, and covered all of East Lindsey. You can read the retail report here. Councillor Roger Featherstone said "There's a limited size of supermarket on the Cattle Market." This has implications for the range of goods another supermarket would be able to stock. "We're not against supermarkets per se," Councillor Leonard said. "But any store will never meet people's expectations of a megastore." Councillor Laura Stephenson mentioned the elephant in the room. "Anybody who wants to get anything from any shop can go online." Whilst Councillor Chris Green pointed out that we stand to lose a lot of trade from people who visit Louth for the small shops if another supermarket were allowed to take their business. Councillor Brian Burnett criticised the report's figures. "The growth they're predicting is not there, it's artificial." There were more comments about the report's methodology, scope, and conclusions along the same lines: no-one was endorsing it. By contrast the council approved the Draft Housing Strategy, and the Strategic Housing Land Availability Assessment (SHLAA for short) didn't attract much comment, although consultation on that doesn't close until the end of February. The Boundary Commission want to adopt a new council size of 55 for ELDC, a reduction from 60 councillors. "I don't believe it's going to make much of an impact on Louth itself," Councillor Stephenson commented. However she did voice concerns about rural wards, because the distances involved mean there's often a lot of travelling for councillors in order to visit people in the area, and this isn't covered by expenses. "It makes it expensive to stand for council," she argued. LCC has proposed a 50mph speed limit for the A16 between a point just south of the junction with North Holme Road, and a point just north of Cordeaux Corner. That's to say the bit that's at 60mph, not the section that's at 40mph just before it. "In my opinion it's probably ten years too late," Councillor Featherstone remarked. "It's still too fast," Councillor Sue Locking agreed. That seemed to be the consensus view, and the council voted to recommend extending a 40mph speed limit up to Fotherby Corner.